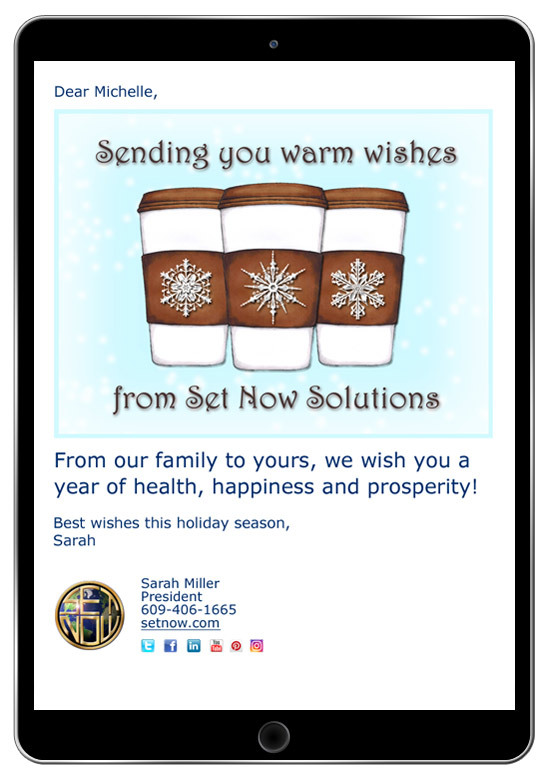 Creating your own custom eCard imagery can be rewarding for you and memorable to your eCard recipients. For example, you can create a holiday eCard with a photo of your staff volunteering, your office decked out for the holidays or artwork you have created to celebrate the season. 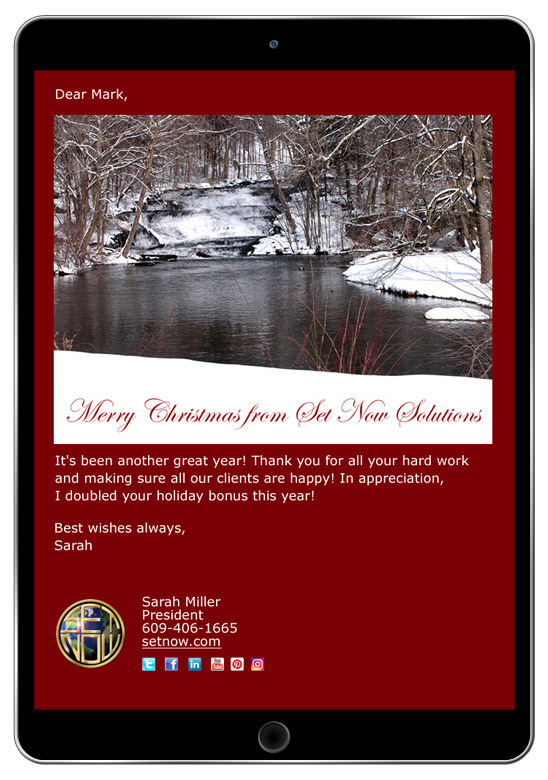 You can upload a photo or digital artwork from your phone or computer and then compose your message and send it to your recipients like you would any of CorpNote's holiday eCard designs. Your uploaded designs have the same tracking and follow-up capabilities as any other eCard. You can create your eCard design using any graphic design software on a desktop computer or using apps on a mobile device. When using a photo or other pre-existing art image, first make a copy so you don't overwrite your original file. If you are using graphic creation software, create your image or edit a photo, add text or other embellishments, and then save your final design as a .jpg, .gif, .bmp or .png file. How to Make an eCard from a Photo or Digital Art: This tutorial provides general specifications as well as detailed instructions for how to use Adobe Photoshop to create your card design. How to Make an eCard - Birthday eCards, Anniversary Cards and more: This article was written for how to create eCards for all occasions and shows examples in a variety of graphic design software. If you are using a smart phone, tablet or iPad, you more than likely have the ability to use the 'markup tools' and other editing apps to edit photos on your device. This is a great solution for quickly adding text and design elements to photos, and for compositing multiple photos into a single image. Pixlr is our favorite free photo editing app for the iPhone, iPad and desktop computers. View our tutorial on how to use Pixlr to create an eCard design. In most graphic art or photo editing software, you can add various art embellishments including borders. There are also tools where you can draw your own elements. PIXLR.com offers a lot of options for special effects and ready-made art elements that you can use. If you used graphic software on your desktop computer, you will need to export your image to a compatible format listed below. Our sizing guidelines are as follows or you can follow the instructions in our tutorials mentioned above. If you are using an image on your mobile device, you do not need to 'export'. You can upload a photo or image right from your phone or tablet. You can upload up to 100 photos or images into your CorpNote account to be used as eCards or invitations. You can upload your images from a desktop computer or your mobile device. Go to the 'Manage Uploaded Designs' area, click the tab for 'Upload' and follow the onscreen instructions. You will have the option to rotate the image, which is especially helpful for photos uploaded through mobile devices. You can also provide a description to help you more easily find the design as well as set the desired eCard background color, text color and font that you want to be the default color scheme when you create your eCard with this image. To create a new eCard using your uploaded image, select create a new eCard and click the "My Designs" tab. You will see all of your designs. Select a design, compose your message, select your recipients and send it immediately or schedule it for any date in the future. You can track your custom designed eCard views like any other eCard you send by going to your sent eCards bin. View statistics are recorded in real-time. For each recipient you will see whether they viewed the eCard, when, and how many times. If your eCard includes an invitation or survey, you will also see if they responded. You can use our eCard direct link feature to send an eCard via text message. Click the 'Copy Link' button next to any sent eCard, open the messages app on your mobile device and paste the link into a message. A thumbnail of the card image will appear and they can click the image to view the full greeting card. Click the 'Copy Link' button next to any sent eCard. The link is now in your copy buffer and can be pasted into any application that enables you to share a link. Social media channels are a great way to reach customers, employees, colleagues and friends for whom you do not have their email address. CorpNote allows you to easily post your holiday eCards to your social media friends and groups. You can either share your eCard by using our 'View/Share eCard' option or use our direct link feature. Important Note: When you use a direct link to share your eCard, you do not have as much detail as to who is picking up your holiday eCard. You will still see how many times it was viewed, but each view will be marked as 'anonymous'. 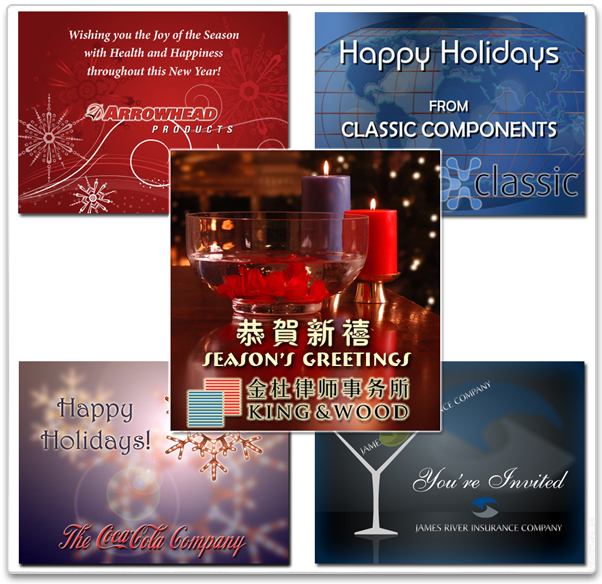 NEXT: Using QuickSend Holiday eCards.